Explore diagrams focus on a single project item, showing all of the items connected to that item. The diagram is dynamic, allowing you to step forward and back through your project data to explore the connections between items. An explore diagram starts with a selected project item in focus. All of its connected items are displayed around it. The power of this diagram is that it is dynamic. You can select any of the connected files, nodes or cases and refocus the diagram on that project item, generating a new diagram showing all of its connected items. Your history of interacting with the diagram is remembered—letting you step forward and back through your project data exploring the connections between items. For example, this diagram is initially exploring the case Dorothy. She is coded at the Positive attitude node. You can explore this node to see who else has expressed a positive attitude. You can change the type of associated items that are displayed on the diagram—for example, show child nodes and hide memo links. 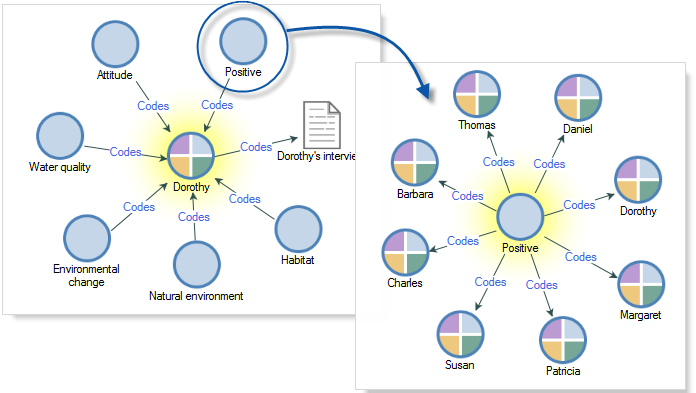 Explore diagrams are not retained in your project when you close them or when you close NVivo. If you want to keep a particular diagram, you could export it as an image file which you could then insert into a document or memo. Alternatively, you could copy & paste it into another application—for example, into a Word document. What can I use explore diagrams for? Nodes that have coded a particular file—for example, What nodes have coded Dorothy's interview? Next, you might explore one particular node to see what other files it has coded. All the files coded at the parent node Attitude. From here, you can explore each child node to see what different attitudes your cases have been coded at. A visual display of the all the connected project items to a selected file, node or case. In List View, select the file, node or case you want to explore. On the Explore tab, in the Diagrams group, click Explore Diagram.